Students often enquire about creating a list of companies in a particular area…sector of the economy, or industry. The Equity Screening function [EQS <GO>] in Bloomberg is an obvious starting point. This allows a number of criteria to be specified, to build a search, step by step. When ‘Country of Domicile’ is selected, the expanding menus on the left hand side of the screen give a breakdown from geographical regions to individual countries. However, it is actually faster to type in the country name in the search field, in this case, ‘United States’. Click ‘Update’. This gives 12,455 companies. Repeat for ‘Sectors’. Here, the expanding menus can come in useful, as you may be uncertain of the category names to enable a keyword search. A recent student enquiry requested US ‘Medical Equipment’ companies. This was located by expanding the options, starting with ‘Health Care’ – and then selected. Click ‘Update’ to incorporate ‘Medical Equipment’ into the search. This gives 202 companies. Whilst there is an icon at the top right of the screen to Export the results to another application, it can be more effective to save the list of companies through the ‘Actions – Save’ drop down menu. Enter a file name (‘US Medical Device Companies’ specified here), press the Enter/GO key to activate the ‘1) Save’ button, and then click on ‘1) Save’. Step 1: Create a List of Securities. 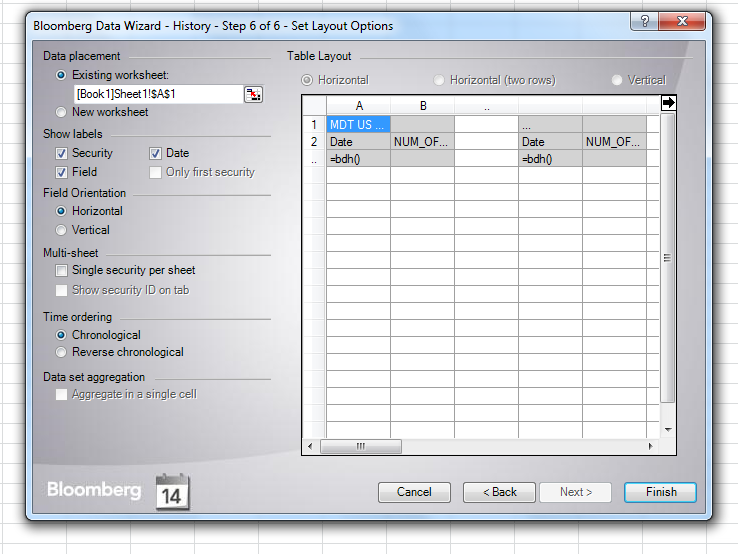 The ‘Select securities’ section allows the source to be specified from a drop menu of options. This includes Indices and EQS – Equity Screening. Once EQS is selected, the field below (Saved Screens) gives access to file names saved – in this case ‘US Medical Device Companies’ – normally at the bottom of the list. This loads the full list of companies to the ‘Available securities’ window. From here, the complete list can be selected (‘Add all’) and copied into the ‘Selected securities’ window, or a subset, then ‘Add’ – as is the case in the screen shot below. Step 2: Create List of Fields. Whilst there are a series of expanding menus [New Fields, Analysis, Corporate Actions, Descriptive, Earnings Estimates, Fundamentals, Market Activity, Ratings] to reveal the data items available, it is actually more effective to search by keyword(s). 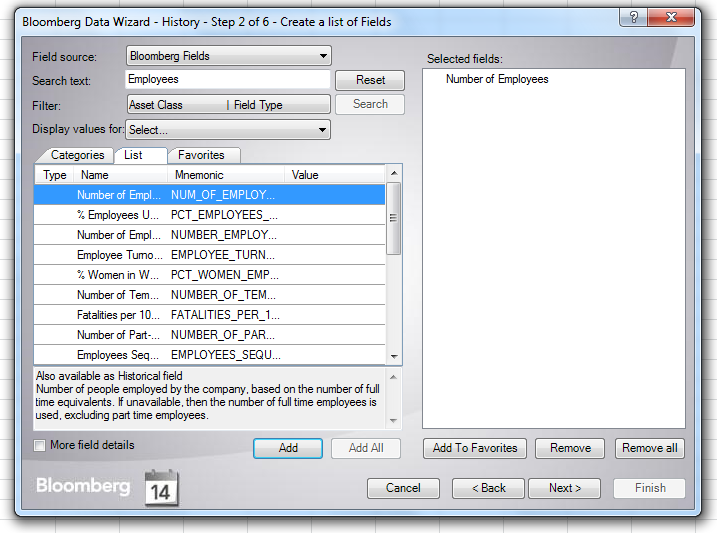 To illustrate, ’employees’ has been used as a search term, to locate the ‘Number of Employees’ field. Once selected, a definition is provided below. Click ‘Add’ to copy into the ‘Selected fields’ window. 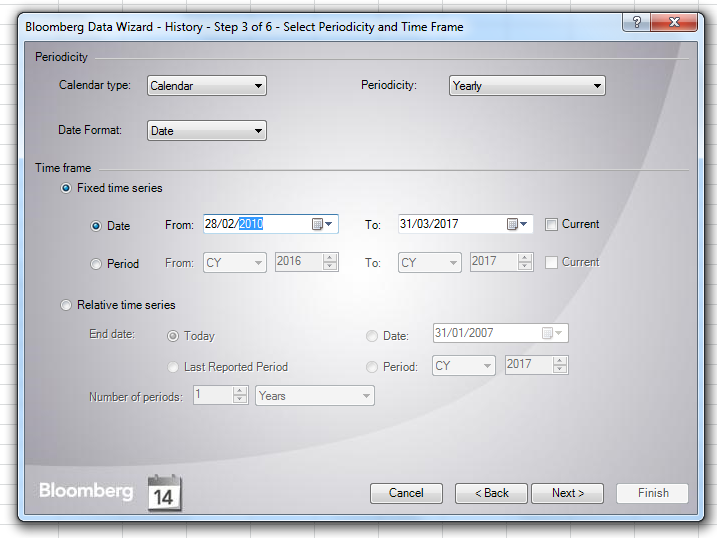 Click ‘Next’, for Date and Frequency options: Yearly, back to 2010 specified. Step 3: Select Perodicity and Time Frame. Click on ‘Finish’ to display results – it may be necessary to widen columns. Although a simple example, this could include many additional data items for each company, for which Excel is well suited. 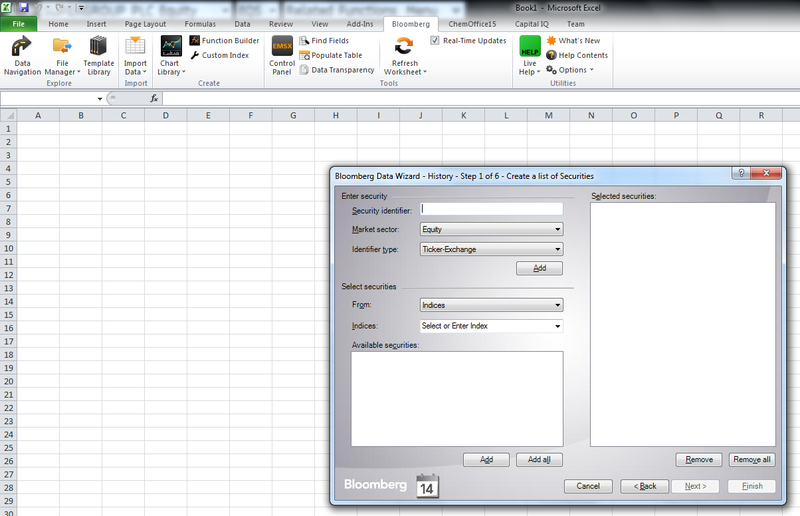 Bloomberg Professional is available to current students and staff of The University of Manchester.